A Bride On A Budget was sent these items for this Glass With A Twist Review. All thoughts and opinions belong to A Bride On A Budget. When Pete and I moved to North Carolina, we didn't know anyone and I didn't drink coffee. We both had a multi-cup coffeemaker, but mine was for when guests came to visit me at my apartment so it was a cheap one I got at Target for $4.44 many Black Fridays ago. I donated mine and we kept Pete's. A few months later, when we still didn't know anyone and I still didn't drink coffee, Pete's dad sent us a single-cup Keurig. It was sitting on the counter, snuggling up to our multi-cup Mr. Coffee. I said, "We don't need the Keurig and the coffee pot on the counter." Pete's reply was: "Well maybe if we have people over for a party or something, then we'll need the pot." We both were silent and he adds, "Yeah, we don't have any friends. What am I thinking? Who is gonna come over for a coffee party? No one. We will never have a coffee party." And I was crying because it was just the funniest and saddest thing in the whole entire world. Fast forward to April. I started drinking coffee because the last sip tastes like hot chocolate, so on weekend mornings, before we have a cup together, we'll ask the other person, "Do you wanna have a coffee party?" So when I got a chance to check out a pair of items from Glass With A Twist for A Bride On A Budget's Virtual Engagement Party, I knew exactly what to order. I absolutely love the mugs. Glass With A Twist sells engraved beer mugs, coffee mugs, pint glasses, shot glasses, and more. You can get images, text, or both engraved onto your glasses. For an engagement gift, you should definitely think about picking up a pair of engraved champagne flutes. You can engrave the actual flute, but personally, I would engrave the base of the flute. It just keeps it a little classier and a bit more subtle for when these are used post-wedding. The majority of the glasses are clear, but I selected blue glass for ours. We have a curio for our glasses and everything on there is clear (except for a little color on the shot glasses). I loved that the blue of the mugs would just pop on our shelf. I also love that I was sent a draft of the image before it was engraved. I told the brand exactly what I wanted and was able to select the font. I received the image below. I was told: "The black areas of your proof will be engraved a frosted white on the glass, while the white areas of your proof will remain clear, un-etched glass." It was exactly what I had in mind. I wanted it to be laid out in a rectangular-ish shape so it didn't look really messy on the mug. But, since the shape was so rigid, I wanted the font to be a bit more playful. This is exactly what I had in mind. 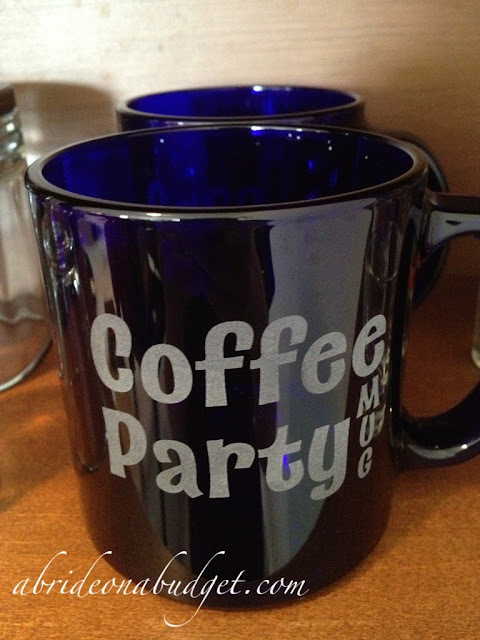 Pete and I have coffee parties all the time now, and we are always using these mugs. In fact, we just used them. They're fantastic. If you wanted to order them for a gift, there's a fast turn around time. Plus, there are no set up charges. There are a bunch of websites that will personalize items for you, but you first must pay a plate fee. That kills the deal you can get on them. Glass With A Twist doesn't charge anything like that, which makes these a lot more cost effective. If you want to order for your wedding (say, a shot glass saying, "Let's do a shot since he's tying the knot"), you can order in bulk and get a discount. You can also order a pitcher and beer glasses for a really personalized groomsmen gift. BRIDAL BABBLE: Take a look at GlassWithATwist.com and let me know what item you would like to receive. I love this idea! And it would be a great gift. Thanks for sharing! These are some cool mugs. I don't really drink much coffee. I like it but I would have to have 3 coffee machines on the counter because my husband will not use the Keurig. Perfect for a gift and I love the blue color. Will definitely check it out! 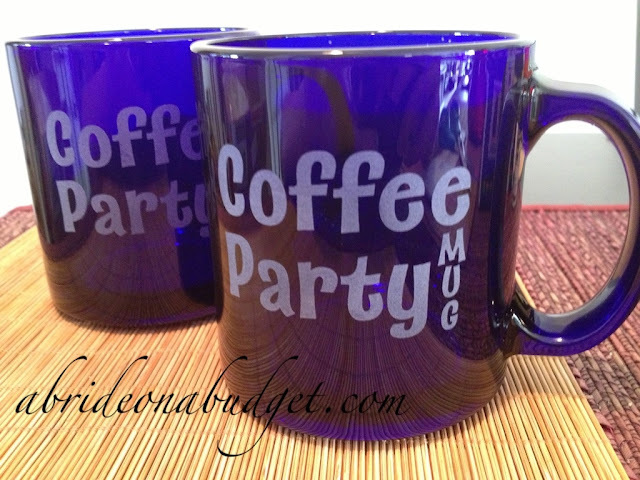 I want to have a coffee party with those mugs! I LOVE these mugs!!!! 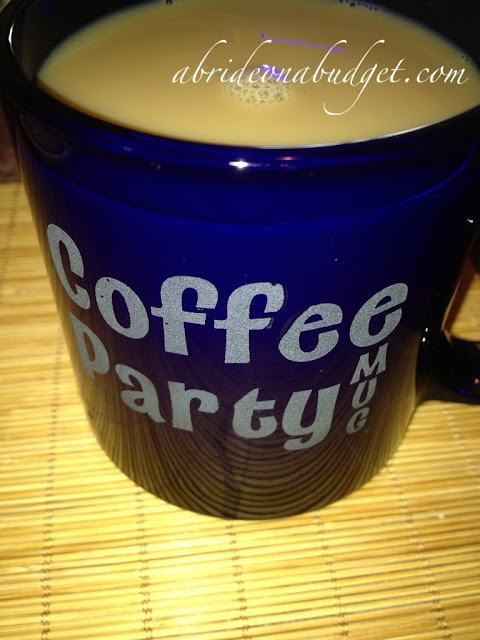 I love Coffee and I think I need a mug just like this for my morning cup! Awesome!